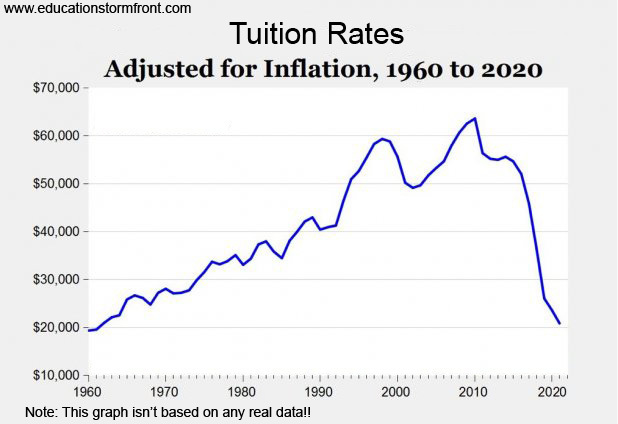 A Graph Of Future Tuition Rates? I’m running on only a few hours sleep so I’m feeling a bit frisky. Let’s have some fun shall we? I came across this article called Don’t Mean To Be Alarmist, But The TV Business May Be Starting To Collapse. First, the author Henry Blodget gets points for a great title. In this article he makes a comparison between the newspaper business model and the cable subscription model. I think that comparison is fair and he seems to indicate that the pattern is repeating itself. He had this great graph to back up his assertion. I love graphs like this. They show you doom so clearly. Inevitably I looked at this and thought about some other metrics we use for higher education. One of them is tuition. That is the life blood of the university system and it has been rising for decades. Even so, will it keep going up? I’m sure that the newspapers looked at the above graph when it only went to the year 2000 and felt good. I mean, it had been going up more or less for 50 years so you would have to be crazy to think it would do anything else? After all, there wasn’t any serious competition to newspapers right? This is where I had a little fun with Photoshop. Same graph, I just changed a few things. A Graph Of The Future? I’ll leave you with this quote from the linked article. Perhaps we will say this about universities pretty soon?